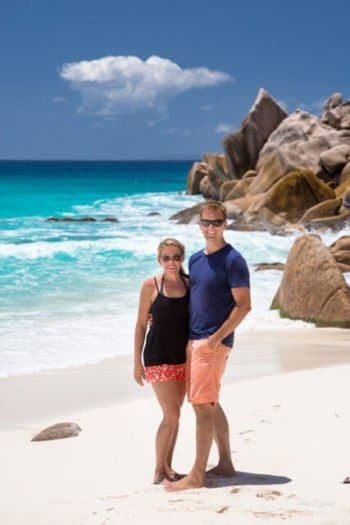 I’m a Flight Attendant and my husband is a commercial airline Pilot and we have traveled to more than 60 different countries. Travel is so important to us for so many reasons. I love to get out of my comfort zone and exploring different cultures. We have found that the people we meet when traveling are just like us. They are hard workers who are loving and providing for their families just as we are back at home. We have made life long friends while traveling in Croatia, Sweden, England and India. Wanting to make her world bigger, I went home and gathered the foreign coins from our travels. I packaged them and added a note with a fun fact about each country. I embroidered a tooth fairy pillow and designed my own colorful world map. Abby has since received coins from Madagascar, Australia, Fiji and Iceland. She is learning about math, geography, and time zones as well as about different cultures and traditions. 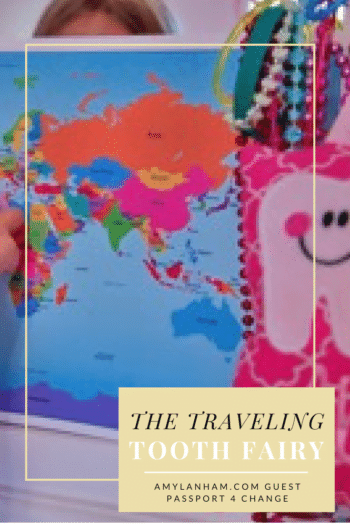 After seeing how much my niece loved seeing all the places the Tooth Fairy travels, I figured other families could benefit from the traveling tooth fairy too. So I launched my business, Passport 4 Change. These kits included 20 foreign coins, a laminated world map, a passport book and an optional personalized tooth fairy pillow. Passport 4 Change is a fun way to spark a conversation about why people may look or speak differently. Traveling helps build compassion for others and you start to feel the world is your home. While we may not all be able to travel all over the world, we can definitely do things in our everyday life that helps us learn about different cultures. Growing up, I was taught that people are all equal and the same. Through my travels I have learned that although, part of that is true; we are actually very different which is wonderful because we have a lot to learn from one another. Why not come together and celebrate our differences. 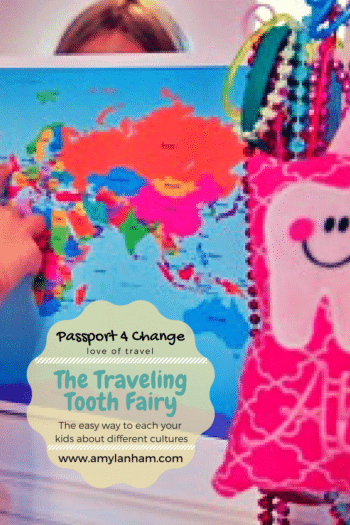 I am donating a portion of each sale from my traveling tooth fairy kits to study abroad programs. True education comes from traveling. You can also follow along on Facebook, Instagram, Pinterest, and YouTube. What a great idea….of course you need to add American currency in with the Foreign. Yes, it could be good for them to have a little spending/saving money too! This is a great idea in order for children to start saving for a possible vacation to one of these unique places they are learning about. That’s a really neat concept. I love traveling too and having my kids learn about places around the world. This sounds like a lot of fun. What a neat idea that is. It sounds like it would also be a nice way to excite children about a ritual some take for granted and get them interested in learning about a place.